Summer is the perfect time for outdoor entertaining. Whether you’re just having a few friends over or hosting an outdoor party for your entire family, getting out of the house and enjoying an evening outside can be a great change of pace. Of course, you do have to do a little planning before hosting an evening outdoors, and that includes decorating. Since you’re going to be outdoors, why not take advantage of the décor already there? Setting up your table near your beautiful flower beds or garden can be a great way to bring in the greens and other bright colors. For your table, cut a few fresh blooms from these flowers and place them in a vase. 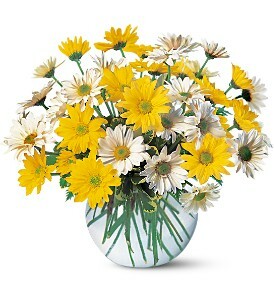 Alternatively, you can order a nice arrangement that compliments the colors of your garden and flowers. You can also bring the summer flower décor indoors. If your guests will need to go through your home to get to your event, place a few vases of summer flowers around your home. If they’re coming in through a gate, you can put a small table near the entrance with summer flowers on it. If you need to put a sign up directing guests to the back yard, you could attach a few flowers to it or put several pots of flowers around it. By letting your summer flowers spread out from the table, you’ll be creating an overall motif that will really impress your guests and show off both your gardening and your decorating skills.